In 3E 433, Sheogorath's Champion put to rest the ghosts of Vitharn who had been cursed to relive the night of their defeat over and over again. The city of Vitharn was founded by Count Vitharn in southern Dementia. The Count brought all those who would pledge allegiance under his banner and set up his kingdom. His wife, Mawean, bore him two children: Csaran and Nweala. The Count and Countess believed that, with a sound knowledge of politics, their son Csaran could certainly usurp the Shivering Isles. When Count Vitharn died his son succeeded him. The Madgod, amused by Csaran's belief that he could usurp his throne, allowed his marriage to Sheen-in-Glade, the daughter of an Argonian midwife. Csaran's reign is remembered most for his infidelity. It is this promiscuity that drove his wife mad, and brought him to the bed of his birth-sister Nweala. The two had a son named Cesrien who contributed in his own way to the fall of Vitharn. The Count Cesrien was born with legs which seemed uneven in length, he breathed in a terrible rasp, was frustratingly dull, and was often sick and under the care of numerous midwives and nurses. As a man, Count Cesrien was quick tempered and had violent tendencies. He seemed to take pleasure in killing, as the early years of his reign were distinguished by his extermination of all beasts, men, and mer in sight of Vitharn. During these years, the lands of southern Dementia were unsafe to travel in, with the roads being littered with corpses of trespassers and others staked to trees as markers of Vitharn's territory. All the while, however, Cesrien grew more and more ill. Eventually, Cesrien became a paranoid recluse, keeping only a select few courtiers in his presence at any given time, although he did continue to appear in public to rally Vassal Fanatics for numerous raids on the countryside. Towards the end of his short reign, Cesrien chose a vibrant Heretic woman from Mania named Jideen as his bride. Tension began to grow between Vitharn and their infuriated Vassal Fanatics, and continued to do so after Cesrien's health failed and his son, Cirion, ascended to the throne. When Count Cirion assumed the throne, some say that he still bore bruises from his father's feeble hand. The young Count was known to be easily frightened, and even by the shadow of a passing bird scared him noticeably. His mother, Jideen, tried for many years to ease the tensions between Vitharn and the Vassal Fanatics, but unfortunately their hate of the Countess' heritage was too deep-seated to be undone by diplomacy. The Fanatics finally snapped, and Vitharn was assaulted and taken by the very ones who had made the city strong. Sheogorath, who was already displeased with the city for sins of pride, cursed its people to relive their final moments of cowardice for all eternity. In 3E 433, Sheogorath's Champion entered the ruins of the fortress and was confronted by the spirit of Count Cirion. The Champion commanded the ghostly army of farmers and incompetent warriors loyal to Vitharn, taking on the role of the Count and finally defeating the attacking Fanatics, ending the age-old battle. 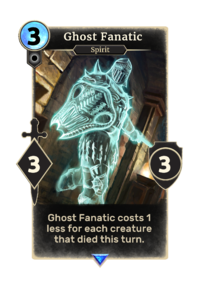 With the curse broken, the ghosts were finally put to rest. 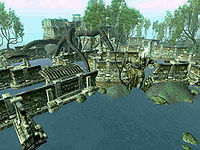 For more information on the ruins of Vitharn, see the Shivering Isles Vitharn article. For information on the associated Shivering Isles quest, see the Ghosts of Vitharn quest. ^ Vitharn's location in the Shivering Isles. This page was last modified on 19 January 2019, at 16:27.